The Samsung Chrono might look like a basic flip phone from the past, but its zero-dollar price tag on contract and $19.99 if you pick it with pre-paid minutes is timely and time-proven as an evergreen. The Chrono has a small 1.7-inch CSTN display up front, while the main screen is sized at the slightly larger 2.0 inches and comes with a QVGA resolution and 262K colors. 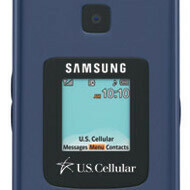 You can forget about modern day complexities like operating systems with the Samsung Chrono, which is a feature phone. For such a price, it’s the Bluetooth 2.1 connectivity that goes as a bonus, but even more tempting is the included in the package hands-free headset (albeit, a mono one). In terms of dimensions and design, it’s pretty much a run-of-the-mill clamshell with thickness of 0.67 inches and weight of 3.14 ounces. The Samsung Chrono sports a GPS for your positioning convenience and a VGA camera for some basic photo capture. Basic messaging and mobile browsing through EVDO 1x are also on board. Finally, you have easyedge services to customize your handset with ringtones, wallpapers, games and business apps. So while it’s not even comparable to contemporary handsets, it can still beat them easily in terms of battery life with its up to 21 days of standby, don’t you think? Does anyone really come to Phone Arena to catch the latest news on clamshell "feature phones"? PA doesn't make a storyline about every new simple phone that is launched, why this one? Am I missing something other than the 2 minutes of my life it took to read this article and post this comment?